For other uses, see Balcony (disambiguation). A balcony (from Italian: balcone, scaffold; cf. Old High German balcho, beam, balketta; probably cognate with Persian term بالكانه bālkāneh or its older variant پالكانه pālkāneh;) is a platform projecting from the wall of a building, supported by columns or console brackets, and enclosed with a balustrade, usually above the ground floor. The traditional Maltese balcony is a wooden closed balcony projecting from a wall. By contrast, a 'Juliet balcony' does not protrude out of the building. It is usually part of an upper floor, with a balustrade only at the front, like a small Loggia. 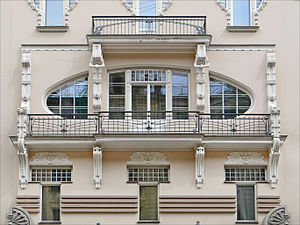 Modern Juliet balconies often involve a metal barrier placed in front of a high window which can be opened. Juliet balconies are named after Shakespeare's Juliet, who, in traditional stagings of the play Romeo and Juliet, is courted by Romeo while she is on her balcony—though the play itself, as written, makes no mention of a balcony, but only of a window at which Juliet appears. Various types of balcony have been used in depicting this famous scene; however the 'balcony of Juliet' at Villa Capuleti in Verona is not a 'Juliet balcony', as it does indeed protrude from the wall of the villa (see photograph below). The Julian Balcony is a slightly larger version of the well-known Juliet Balcony, protruding slightly from the wall, unlike the smaller Juliet balcony, and spanning at least two windows rather than one; this variation was made famous by Julian Assange's numerous addresses to the press from his refuge in the Embassy of Ecuador, London. Sometimes balconies are adapted for ceremonial purposes, e.g. that of St. Peter's Basilica at Rome, when the newly elected pope gives his blessing urbi et orbi after the conclave. Inside churches, balconies are sometimes provided for the singers, and in banqueting halls and the like for the musicians. A unit with a regular balcony will have doors that open up onto a small patio with railings, a small Patio garden or Skyrise greenery. A French balcony is actually a false balcony, with doors that open to a railing with a view of the courtyard or the surrounding scenery below. In theatres, the balcony was formerly a stage-box, but the name is now usually confined to the part of the auditorium above the dress circle and below the gallery. Balconies are part of the sculptural shape of the building allowing for irregular facades without the cost of irregular internal structures. One of the most famous uses of a balcony is in traditional stagings of the scene that has come to be known as the "balcony scene" in William Shakespeare's tragedy, Romeo and Juliet (though the scene makes no mention of a balcony, but only of a window at which Juliet appears). WikiLeaks founder Julian Assange at the Embassy of Ecuador, London. Manufacturers' names for their balcony designs often refer to the origin of the design, e.g. Italian balcony, Spanish balcony, Mexican balcony, Ecuadorian balcony. They also refer to the shape and form of the pickets used for the balcony railings, e.g. knuckle balcony. ^ Lorinc, John (16 August 2017). "The rise of the balcony". The Globe and Mail. Retrieved 19 August 2017. Look up balcony in Wiktionary, the free dictionary. "Balcony" . Encyclopædia Britannica (11th ed.). 1911.